CV-17 USS Bunker Hill was one of many aircraft carriers of the Essex class built in the early 1940s. Commissioned in 1943, the ship completed training and small missions in the Atlantic before being sent to the Pacific to help during World War II attacks on Japan, Rabaul and the conquest of the Gilberts. Bunker Hill also supported the invasion of Saipan and the Battle of the Philippine Sea. Two crewmen were killed in the battle with the Philippines due to a bomb that hit nearby, but the damage to the ship was minimal. She remained in the war with Japan through the majority of 1944 before being sent home for repairs and modernization. 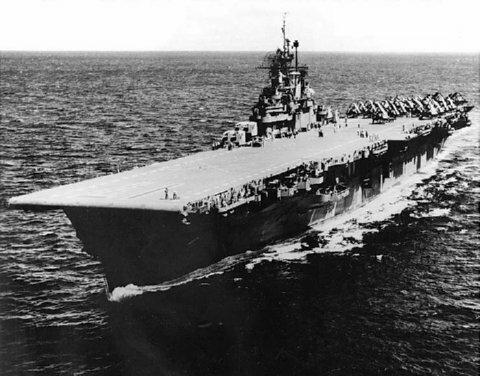 She was quickly repaired and returned to the Western Pacific in 1945 to help with the Iwo Jima invasion and raids on the home islands of Japan. She was a flagship of Task Force 58 and was very involved in the Okinawa campaign. In May of that year, the Bunker Hill lost almost 400 crewmembers after two attacks by suicide planes. She was repaired and used for transport for the rest of the year and then placed out of commission before undergoing three reclassifications through 1959. Bunker Hill was then used for stationary electronics testing through the 1970s until she was sold for scrapping in 1973.